By DavidDru, March 25, 2016 in Members Pictures - Speakers, Electronics, etc. Came across an exciting opportunity to pick up a somewhat rare Technics turntable the other day. It is the SP-15 table with EPA-501H arm, EPA-B500 mount on the SH-15B1 plinth combo. The plinth is a very nice Rosewood. The current cart is only a Shure M44-7 and will be upgraded. Did not include the dustcover. This professional table from 1981, was sold to consumers and radio stations. It wasn't necessarily used at the stations for playing the music as much it was used in production rooms for under voice overs etc. it weighs in at 50lbs/22.7 kilos. It is manual. Has a lot of torque and ramps up to speed immediately then brakes similarly. Specs are impressive. I got it from a local Professional Broadcast Engineer at the local PBS radio stations. He got it out of a station warehouse and refurbished it (mostly just dust and lubricant age). Thought I would share since it is a little off the beaten path. 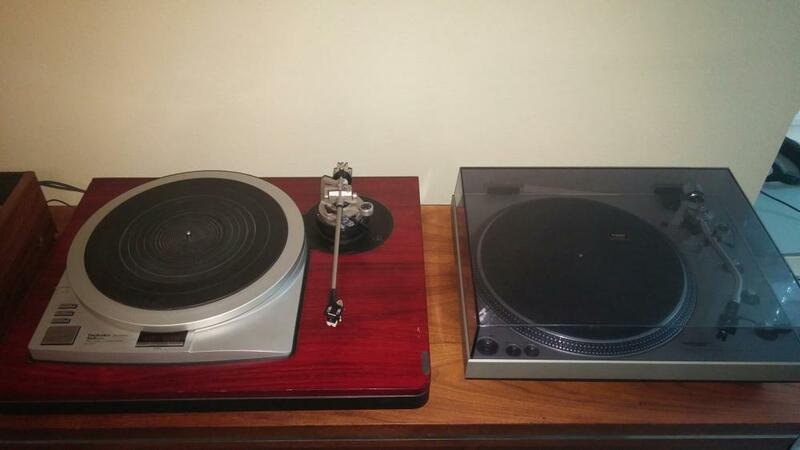 My SL-1300 is next to it in the photos to help illustrate it is a big one. 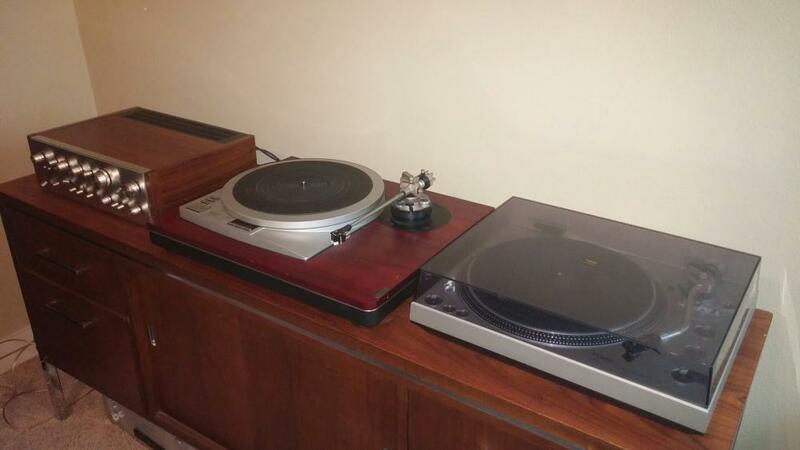 Technics never held an allure for me, but that table is gorgeous. I would definitely have no problem owning that. Looks like an original 44-7. Check the stylus under a microscope if possible, and if it's good hold onto it. Excellent cart. If you're looking for a great bargain in new carts, consider seriously the Shure M35X. Can be had for $40 at Amazon and is a seriously good cart at 5 times that price. It's a butte for sure. 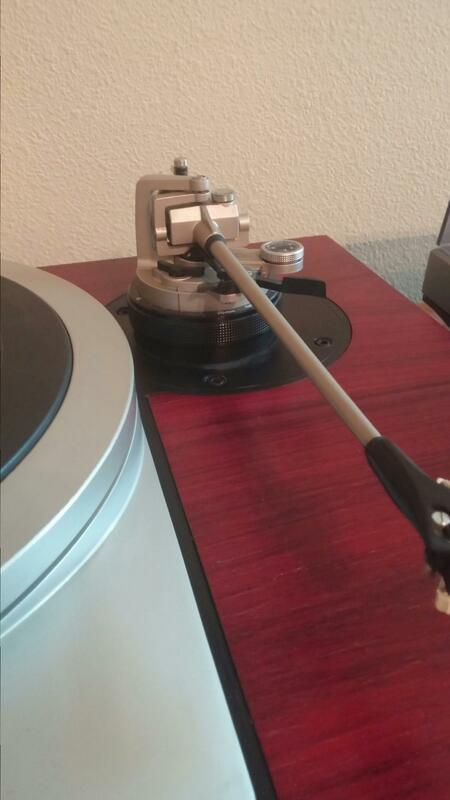 I am going to have to step up my game and gain a better understanding of high end turntables and what makes them tick. This table is worthy of expensive high compliance carts so I will need to rationalize just how far to take it.